A Content Management System (CMS) is a system that allows you to log in online, and through an online interface, make changes to your web site. Using a Content Management System you can add pages, make text changes or add pictures to existing pages, change your navigation structure, or make other changes as needed. Having a CMS is becoming more desirable for web site owners, so they don’t have to learn to use a web development tool like Dreamweaver, and also so they don’t have to depend on a web designer every time they want to make a minor change to the site, such as updating dates or other information. I’ll admit that earlier on I pooh-poohed Content Management Systems, as some of the early ones I had contact with were difficult to use and very limiting in terms of what you could do. But the field has evolved and the solutions out there today have gotten much better. 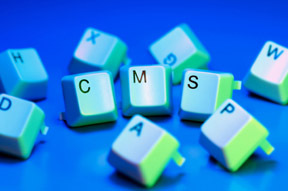 There are three CMS’s that are considered the top ones: Joomla, Drupal, and WordPress. Each system is good and very usable and which one you choose depends on which one you are familiar with. I started designing blogs using WordPress, which is considered the gold standard for blogging systems. Then I started seeing more and more sites being designed using WordPress as a CMS. This allows the web site owner to log in and make any changes to their site using the WordPress interface. So in cases where a client wants a CMS, I am now building sites using WordPress. WordPress has a number of advantages. First of all, anyone who has done any blogging using a WordPress system is already familiar with how to make changes using the WordPress interface. We can deliver a site to a client using any one of the above CMS’s, but I recommend WordPress for overall ease of use.